"Where did the trash go? It's reached your body." 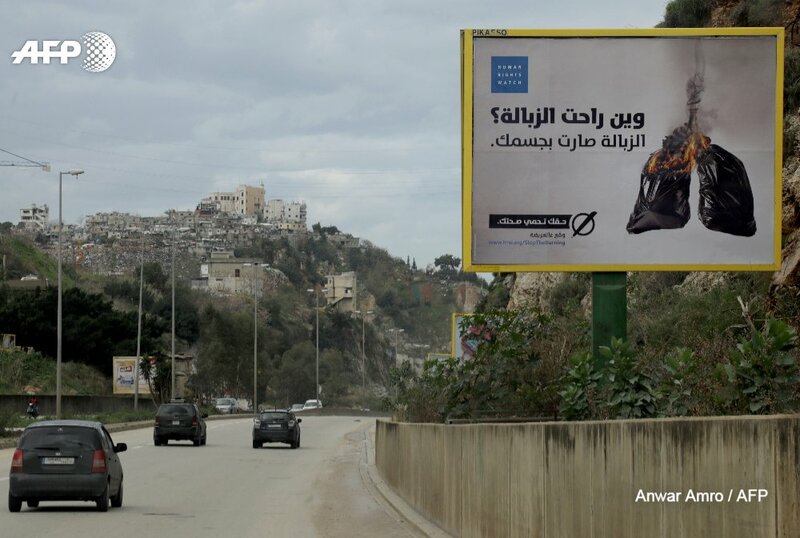 Human Rights Watch launched a massive digital and billboard campaign in Lebanon on January 19, 2018, calling for the end of open air garbage burning. This was done just over a month after releasing a report with video footage of the issue. The campaign also includes a petition targeting Lebanon's Parliament and Cabinet. This is only the latest reminder that the garbage crisis is not just an issue about science and technology, and the environment; it's also about human rights. There are over 900 dumps where open air garbage burning takes place; over 150 of them burn garbage at least once a week. Most of them are in socioeconomically vulnerable areas. This fact alone indicates that there is a human rights and class element to the crisis; it is beyond the issue of science and technology. Lebanon's garbage crisis goes back decades, and the issue of open burning has never been properly addressed. There's also the new Burj Hammoud and Costa Brava landfills. These unsanitary landfills are done to reclaim land from the Mediterranean Sea to generate money and build real estate, all while causing water pollution and impacting not just the health of people, but the livelihoods of fishermen. There's also the famous "garbage mountain" in Burj Hammoud, the unengineered dump. Without going into too much detail, it's evident that there are some reoccurring trends in waste management policy in Lebanon: not only does it ignore the well-being of the environment and the Lebanese ecosystem, but it also targets populations below the middle class. While garbage no longer fills the streets of Hamra and Gemmayze in Beirut, they're still present in someone else's backyard. It's a clear policy of profit over people. This year will be an interesting year for Lebanon when it comes to waste management. The question will be whether human need will be the key driving force. During the garbage protests in the summer of 2015, ask any person why they're demonstrating and they'll point their fingers to Sukleen, the private waste management corporation. Though they ceased operations in the Metn and Kesrouan regions in May 2017, they are set to stop their work in February. In comes Ramco, another Lebanese corporation that is also involved in real estate and facilities management. While they have already started handling waste management services in Metn and Kesrouan last June, they're set to continue in Beirut after being the most successful bidders in September. We are yet to see any details about whether or not their procedures and services will differ to Sukleen's, and what their budget will be. In short, is their waste management practice economically efficient, environmentally-friendly, and considerate of vulnerable populations? There have been explicit talks about incinerators over the past year, especially from Environment Minister Tarek Khatib and some municipal governments. On January 11, Cabinet agreed to open bidding from corporations for incinerators in six months. While studies have been conducted on them for the past year, they have not been made available to journalists nor the general public. Incinerators exist in countries with healthy environmental practices. The questions that need to be answered going forward are: What's the budget? Will waste be properly sorted (organic, recyclables...etc) to minimize what is being incinerated? Will these incinerators be placed far from residential areas? And of course: what are the conditions in which the bids of these corporations will be accepted? Is it another case of profit over need? Parliament elections are scheduled for May 2018 after being postponed numerous times over the past five years. What will be interesting about this one is the multiple slates and coalitions from different elements of Lebanese civil society that built off the momentum of the 2015 garbage crisis protests. And the petition's role in all this? If enough people locally and internationally sign it, perhaps it could reveal and expose more details of all the candidates' environmental policy, and the type of measures they are trying to push for (at least) the next 6 years.